Best Practices: Using Research to Position Your Company For Contract Wins from Market Connections, Inc. on Vimeo. 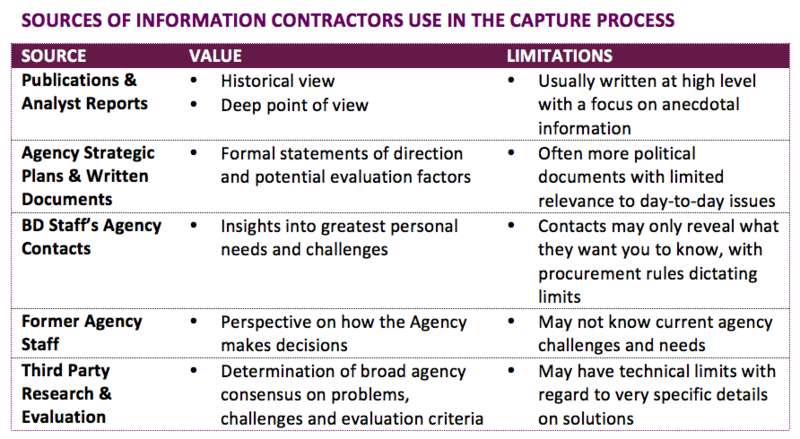 Every person who competes for contracts understands the value of information: information about what the customer needs and wants, including information about competitors. For government contractors, there is a range of sources to gather this information. As the table below shows, all the sources have value as well as limitations. As a market research firm, we feel capture research is important to add into the data gathering mix. Recently, our Executive Vice President, Aaron Heffron, shared the importance of capture research to help contractors learn exactly what they need to know to position their company for the win. Does our target audience know who we are? What do they know us for? Is our messaging aligned with what they deem important? How do we stack up to our competitors? Capture research can unveil how you are perceived by the agency in comparison to competitors/incumbents, understand key features and characteristics important to your customer, and provide key insight for developing winning themes and messages needed for your proposal. Watch the recording of Aaron’s webinar to learn more. And check out some other resources that provide insight on winning government contracts.